So says her artist’s statement. So says her work, once it is viewed. Her current exhibit, ‘Retrospective: At Peace’ is featured at the Art Corner gallery, 264 Washington Street, for the month of September. Robin’s technique is unique, combining the knowledge passed on to her by many teachers, not the least of which is Zen thought and perception. Robin uses recurring themes of lotuses and geisha to drive home her lesson. Trees also predominate. ‘Path’ is a perfect example of Robin’s ideas in Zen. A line of winter-bare trees follows a well-beaten path through the woods. Is this the right road for us to follow? Where does this Path lead? Such thought-provoking ideas permeate Robin’s art. This is the poem that Robin placed with her painting ‘Light in the Woods’, and it is perfectly matched to it. Robin likes words. 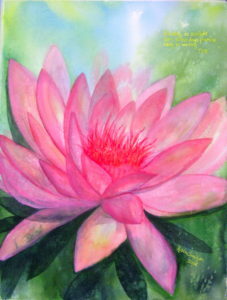 Many of her paintings incorporate Haiku and bits of knowledge that expand our appreciation of her work. The words draw us in and make us think. The titles do, too. ‘Wisdom Tree’ is a perfect example. 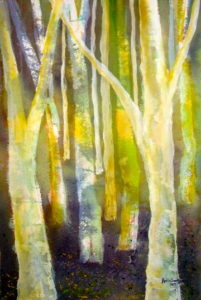 The image is of a birch tree, stark white against a background of night and a forest of other birches. The moon hovers overhead. Spatterings of color illuminate the view. What is the artist trying to tell us? How is viewing a tree going to give us Wisdom? This is Zen. ‘Huangshan Pines’ [image at top] gives another example, as if what I’ve presented so far wasn’t enough. (And let me tell you I really wanted to end this column at my ‘This is Zen’ statement!) At Robin’s very enthusiastic, well-attended opening reception on Sept. 14, complete with pan-fried wontons and feng shui flute music, my brother, who greatly admires Robin’s work and was studying it closely as to which one he wanted to have in his collection, pointed out a serendipitous image in this particular piece. ‘Huangshan Pines’ hosts the face of a samurai warrior! To the left of the pine covered hillock is a hazy view of the mountains in the background. One of those mountain peaks contains a profile of a fierce Japanese warlord, his single eye piercing the gloom, his sharp nose and chin stabbing at his enemies, his black hair pulled back into a tight knot at the crown of his skull. Look closely; stand far back, and study it! You’ll see it! I’d bet Robin didn’t intend this profile, much as Mother Nature never intended the sadly missed ‘Old Man on the Mountain’ profile, which is New Hampshire’s state seal. 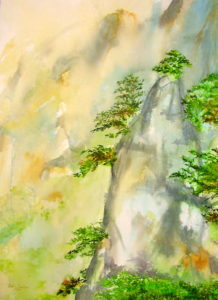 The ‘Japanese Warlord’ just happened in the ‘Huangshan Pines’ painting. A happy accident! My favorite of Robin’s work is ‘Blushing Lotus’ and the wonderful haiku, provided by Robin’s studio-mate Terry, I like this piece the best. Why? I don’t know. In the end, I just like it. And that’s what Zen is all about. Not over-thinking things. Just letting things be things. ‘Do you like it?’ That’s enough. Wendy Snow-Lang is the owner of the Art Corner and the author and illustrator of a published comic book, ‘Night’s Children’. Wendy is a founding member of the new Salem Arts Association, which is dedicated to preserving and enhancing the arts in Salem and on the North Shore.